Batat potato is a plant that only recently became famous around the world. Encouragingly, the cultivation of sweet potatoes is successful in the world and many farmers do it. Although it is called the sweet potato it has nothing to do with potatoes and belongs to the family of Slak (Convolvuaceae). There are many varieties of this culture and commonly grown varieties are orange, red or dark purple and white colour. Below find out how it is grown and what are the health benefits of this vegetable, and how to prepare a delicious meal with sweet potatoes. Batat potatoes in warmer regions is a biennial plant, and is commercially grown as an annual crop. It grows best at about 25 degrees, and is very sensitive to low temperatures. It grows on land that is clear and does not contain a lot of nutrients - usually referred to as depleted, which is an additional plus for sweet potatoes. It comes from the tropical areas of Latin America. People have been using it for at least 5,000 years in various ways, while today it is a widespread culture in the tropics. Batat potato for quality growth and development needs three to five months without frost and low temperatures. It is most commonly grown in a vegetate manner, from seedlings, with increased vigilance and attention to the temperature of air and soil at the time of planting. Growing sweet potatoes certainly has many similarities with the cultivation of potatoes, seedlings are placed in the order of about 30 cm from each other and at 120- 130 cm of spacing. The first 5-6 days should be more intense with spraying, and later not so much only in cases of major drought and similar disasters. Planting sweet potatoes is carried out in May and even in June, because it will reach a satisfactory root weight after 90 days. If planted on time, it can make a fine progress and can reach up to 5 kg in weight, which is very profitable. Sweet potato is very healthy, and for this purpose the root and leaves of plants are used. This is a high-energy plant (full of starch and contains low amounts of sugar), it has a very interesting taste and is rich in valuable vitamins and minerals. Because of the multitude of minerals (magnesium, calcium, iron and potassium) and vitamins (C, E, A, B) batat potatoes supply the body with important antioxidants. 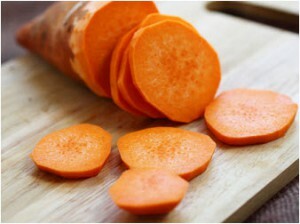 The biggest value is the large amount of beta carotene, which is indicated by its orange colour. Let’s say that only 200 grams of sweet potato has the same amount of beta-carotene like 5 kilograms of broccoli. Only 140 grams of sweet potato provides a daily need for vitamin E, which is an extremely important and almost indispensable in protecting the body from heart problems, as well as congestion of blood vessels. As batat potatoes are excellent for the heart and blood vessels, skin, it is also outstanding as it strengthens the immune system, as well as prevents and reduces various inflammation – and contains vitamins C, B6 and E and carotenoids. In addition to the aforementioned minerals, it is rich in anthocyanin and fibre, which significantly lowers CRP levels of protein in the blood, and therefore effectively gets in the way of many inflammations. If you are not a fan of cereals (particularly wheat), sweet potato is an excellent substitute for them and is especially effective in combating inflammation of the colon and urinary channel and inflammation of the kidneys. Paradoxically, although rich with fructose, sweet potato regulates cholesterol and is recommended even for people with diabetes. In addition, it has been proven that these foods slow down aging, but also prevent the occurrence of several types of cancer. Batat potato is fat-free and does not contain cholesterol, which is very important for those who have problems because of elevated blood fat and bile. Its 100 grams contain 129 calories, 29 g of carbohydrates, 1 g of protein, and what is important for us 0g of fat. Did you know that batat is a great source of dietary fibre, essential for proper digestion, reducing the risk for colon cancer and similar diseases, and is used as a healthy diet, with all mentioned problems. Sweet potato is a very useful food for diabetics, because of low glycaemic index, which provides a slower absorption of glucose, and no stress on the body. Did you know that batat potatoes should be eaten by babies and young children? Sweet potato can make a variety of soups and pies, and is served as a side dish to meat - if you suffer from inflammation, it is best to eat it with chicken or beef, which also have anti-inflammatory effect. For the dish we use secondary thickenings of roots and young green leaves, which can be used for a soup or salad of sweet potatoes. It can be cooked, baked or fried. Before using it for food, root and leaves need to be thermally treated. Recommendation of nutritionists is to consume batat potatoes (regardless of preparation) at least two to three times a week. During heat treatment it does not change its properties and characteristics. Cooking sweet potatoes on a steam is a much better option than cooking in water, and to preserve taste and aroma, it is necessary to cook it 30 to 40 minutes. It can be baked in similar ways as regular potatoes and can be served as a main dish or served as a side dish with meat. It is suitable for grilling, and can be processed into flour or chips. You will love the sweet potato dishes and your children also will enjoy it. 4 boiled eggs cut into thin slices. 2 cloves of garlic, chopped small. Batat potatoes should be first cut into thin slices (if you use all four types of sweet potatoes, pink and white cut thinner than the orange and blue). Cut to a thickness of approximately 2 to 3 mm. Fry garlic and onion in olive oil, after 7-8 min. add the meat and fry them at a slightly higher temperature. After that, add it to mashed tomato, oregano and cook for good fifteen minutes on medium temperature. At the end, add the thyme. Blanch the spinach strain well and cut into strips. Heat up the oven to 180 degrees. In the corresponding ceramic bowl, add a layer of cream, and sweet potatoes and do not forget to add salt. For now add a layer of meat, over which you put a bit of cheese and sour cream, and again batat potatoes and salt. The next layer is spinach, then cheese and sour cream and again red sweet potato and meat. At the top put the egg rings and little cheese and sour cream over. The final layer is the sweet potatoes, poured down with sour cream and grated cheese. Put in the oven and bake for 40 minutes! We hope that batat potatoes will get their place in your kitchen, feel free to send us your recipes and we will gladly publish them.